I grinned, remembering the last time we made the fudgy and delicious dip. We’d shared it with a platter of whole grain crackers and cut fruit, and my toddler had managed to cover her entire face with the chocolatey goodness. 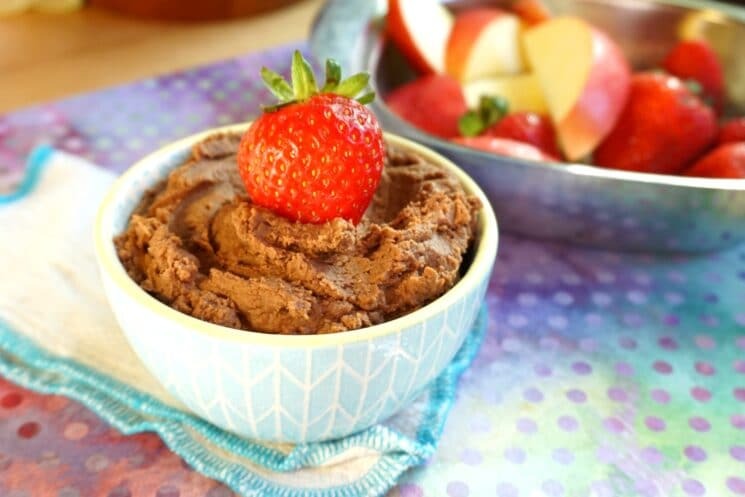 Not only was was it delicious, our healthy chocolate hummus was chock full of super nutritious ingredients like chickpeas, peanut butter, and antioxidant-rich cocoa powder. 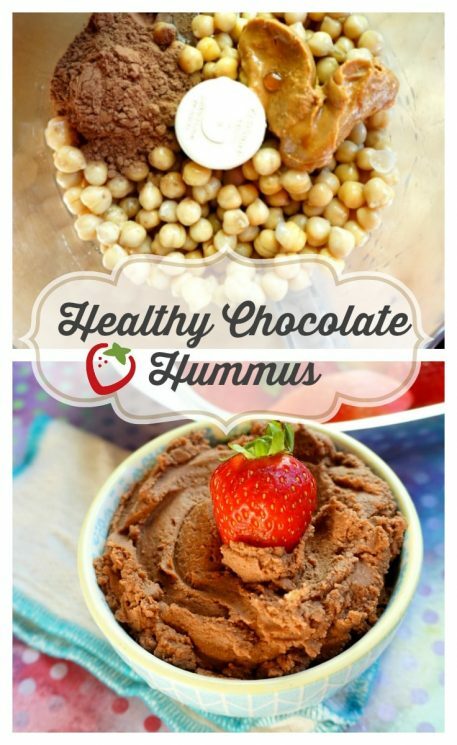 Chickpeas, the main ingredient in Healthy Chocolate Hummus, are a super-healthy food! Chickpeas have been shown to improve blood sugar control, cholesterol, and digestion. They’re rich in fiber and protein that helps you to feel full, and have balanced energy. My favorite thing about beans is that they’re tied to a longer life! Beans are amazing. I just love them and I’ll eat them in everything. 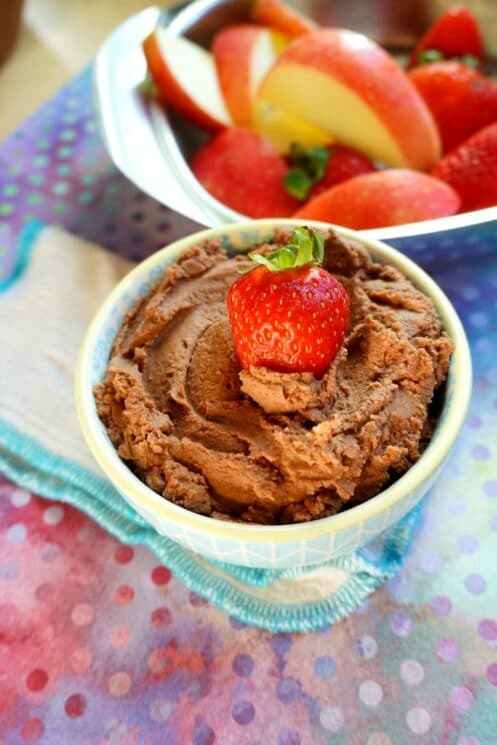 But if your kids (or you) don’t love them, Chocolate Hummus is a perfect starter recipe. And it’s easy and fun to make! Read on to learn how. Here’s why I said “almost”: the only little bit of fuss you need to make over this hummus is to make sure you’re using no-salt-added beans. Most canned beans contain a LOT of salt, and you can sort of imagine how that would taste in a velvety chocolate dip….SALTY! So you’ve got two options: look for no-salt-added canned beans, or cook your own chickpeas from scratch. I usually go the scratch route, soaking and cooking a whole pound of dried chickpeas in my Instant Pot at once. They only take a few minutes to cook, and as a bonus, I’ve got extra chickpeas to throw into a curry or a salad. Sweet! Once you have your unsalted chickpeas, just put them into a food processor with cocoa powder, maple syrup, vanilla, and nut butter. 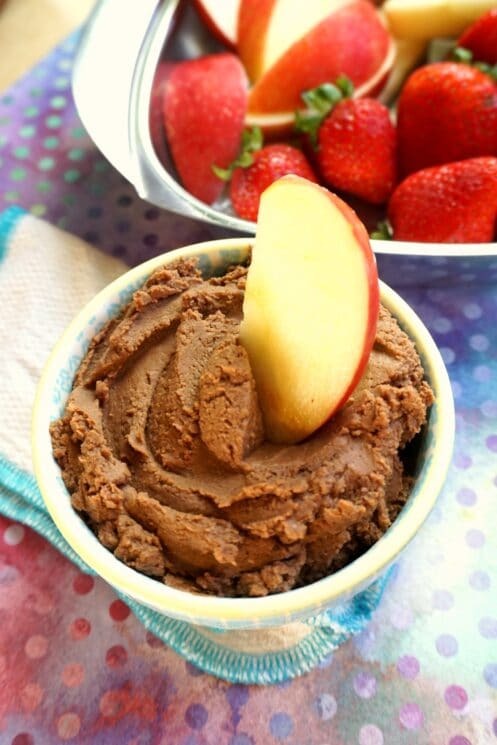 Let your kids push the button and watch these simple ingredients transform into a rich and creamy chocolate dip! We’ve paired Healthy Chocolate Hummus with all kinds of fruits, crackers, and pitas… our favorite is apple slices. Hi Bobbie! I haven’t tried it myself, but I imagine sunbutter would make a good substitute. I have another recipe that uses coconut oil instead of peanut butter. How long will this keep for? Looks delicious! This looks very good, especially on the apples. I made this recipe with a group of elementary school children and used black beans instead of garbanzo beans, and honey instead of maple syrup. They really liked it! This group are from a low-income area so we had to adjust some ingredients to make it more budget friendly and familiar to what they eat on a regular basis. So try it also with black beans…you won’t even taste the beans! Just wondering why does it matter if the kids are from a low income area? All of the ingredients are cheap and enjoyed by all cultures! Great recipe I will be trying this in my after school cooking class where children come from all backgrounds. ? There’s usually not a grocery store conveniently located in low income areas. The local dollar stores, such as Dollar General, are usually a bit closer. These stores carry a limited variety of foods. Black beans are more common than chick peas and more likely can be found in such stores. There are more barriers to consider than just low income. For children with nut allergies is sun butter a good substitute for the nut butter? Hi Carrie! I haven’t tried sunbutter, but my guess is that that substitution would work just fine. Please let us know how it turns out! Has anyone tried this using tahini instead of “nut butter”? Hey! I’m not a fan of maple syrup or honey- if I use sugar – to I need to make it liquid- like a simple syrup? Yesterday I made some dry black beans. 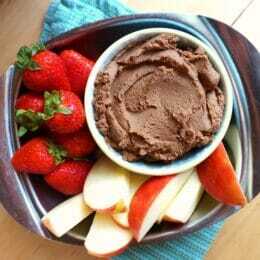 Today, I made half a batch of your hummus and added 1 scoop of chocolate whey protein powder. Hooyah! I will spread this on some Graham crackers and tote with 1/2 a banana instead of a store bought protein bar on my outings. Kudos to you for this wonderful recipe…my grand daughter will love it with fresh strawberries. I am so happy to find a recipe for those who are lactose intolerant!. I found out one month ago that my kids and i cant have dairy but we love chocolate so this is perfect. And best of all this recipe is a healthy one. THANK YOU. I used premade hummus, original, thinking it would be quicker, but forgot it has garlic and it was too spicy for kiddos. So next time, I will use the chickpeas. There is no garlic in this hummus. What recipe are you looking at? YEAH!! I’m bariatric and was looking for a recipe I could eat… safely… within my guidelines and restrictions ~ this one fits since I’m in maintenance! I watch my calories and my macros nutrients ~ It’s all about portions and what’s eaten with it! ???. Enjoying this immensely!! Thank you! I’ve never cooked chickpeas in my instant pot. Please tell me how long you soak yours & how long you cook them in your instant pot. This recipe looks yummy! I soak my chickpeas overnight (arouind 8 hours) and cook them in the Instant Pot for 16 minutes at high pressure, with a natural release. Just make sure the chickpeas are well covered with water, and that you add a drizzle of EVOO to keep the foam down before you lock the lid. It works great! Hope this helps. Is this recipe using canned chickpeas? I assume you can use almond or cashew butter in replacement of peanut butter too? What do you recomend if the hummus is too thick & needs to be thinned a bit for a smoother consistency? I add a little coconut milk and blend it smooth. Then I put it in the freezer to get cold… but not too hard. Then I put it in an ice cream cone and enjoy… just like ice cream. Can I use banana to replace the maple syrup? Thx. I haven’t tried this substitution, but if you do, let us know if you like it! 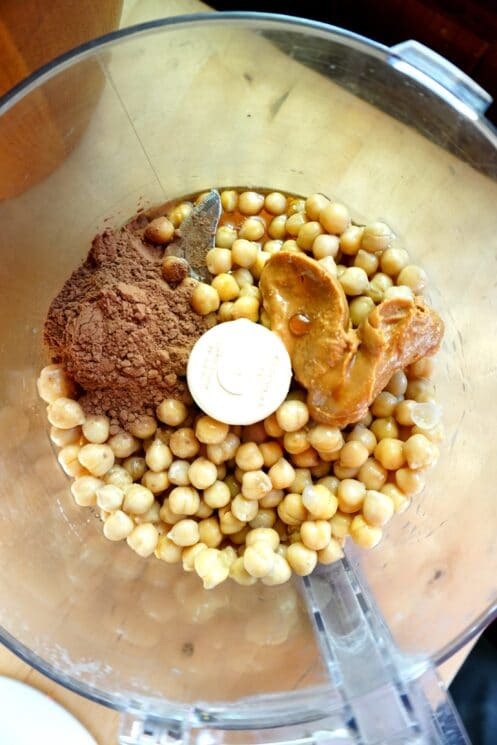 Can you add a little water so that the chick peas can easily grind in the mixer or are the liquids enough to make it a paste?